OKCD honors Jude Sensei with the Jude Barcenas Award for Drive, Dedication and Excellence. The third recipient went to Rebuen Palacios on Jan. 19, 2019. He received over $1400 from all of the OKC students and the help of the Barcenas Family. Congratulations Reuben. O'Sensei Shimabukuro (1925-2017) passed away. On October 22, 2017 O' Sensei passed away O'Sensei taught thousands of students from all over the world. He touched so many lives and many of the OKC students. He will be missed immensely but we will continue to honor him by teaching his material. The second recipient went to Mazen Daou on Jan. 21, 2017. He received over $1000 from all of the OKC students and the help of the Barcenas Family. Congratulations Mazen. The first award went to Giselle Martinez. See the photos on our gallery page. We lost our dear friend Jude Barcenas Sensei to ALS (March 22, 1956 - October 31, 2013). He will forever be part of OKCD. In total, we raised $500.00 from the Suzuki cup ($117 in change), plus a donation of $100.00 making our grand total $600.00. Rajesh's company then matched $500.00 so we actually raised $1100. Way to go OKCD! The money was sent to the Japan America Society where it will help Sendai, Japan, which was one of the hardest hit regions and is also Dallas' sister city. (www.jasdfw.org). May 7,2011 - 1 PM. Next Shodan test will be January 22, 2011 at 1 PM. 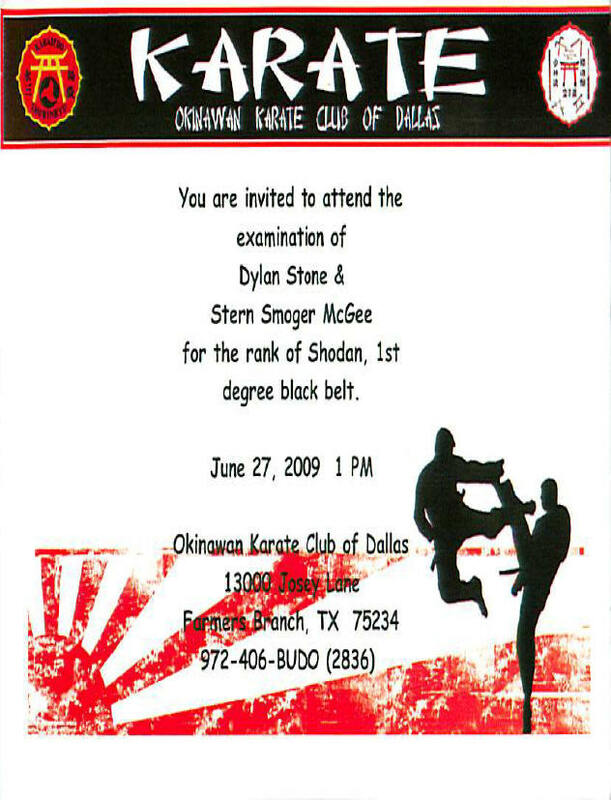 Next Shodan test will be June 26, 2010. Followed by a luncheon at Nuevo Leon. Celebrate O'Sensei's 60 years of teaching. Jeff McKissack. from Club Nin hosted the showing of The Sensei that OKCD attended. Metrocrest Social Service Center (www.socialservicecenter.org) located at 1103 S. Josey Ln, Ste 114, Carrollton, TX. 972-446-2100. The Okinawan Karate Club of Dallas is raising money to help our friends from Louisiana as a result of Hurricane Katrina. Please fill up our Suzuki Cup. We raised $206.00 in the first cup and one of our yudansha's employers matched our contribution so our first cup was worth $412.00. Keep on going OKCD! Second cup $136.81 which turned into $547.24 for a grand total now of $959.24. The third cup $130.35 made a grand total now of $1089.59.